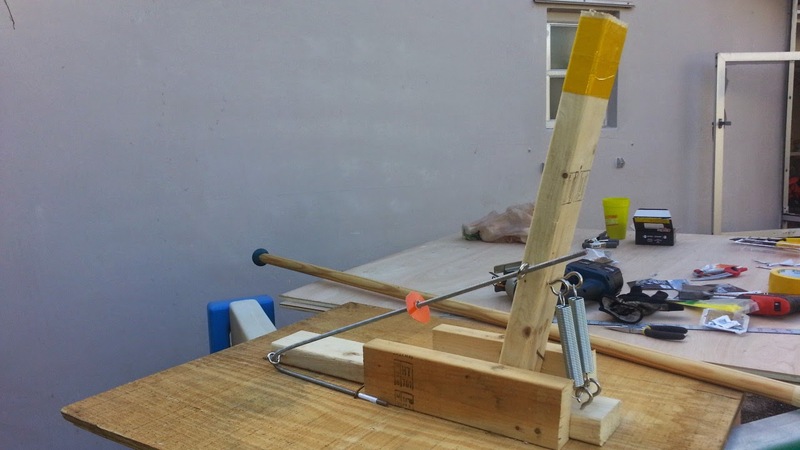 A simple pendulum for testing the strike force of spears. There is a renewed interest in testing the type of spear strikes that hoplites used in battle. Much of this is done with more enthusiasm than science, but enthusiasm goes a long way. I thought I should post images of a very simple apparatus for accurately testing strike force. The simplest means of testing strike force is to hit a pendulum. If you can hang something heavy, like a barrel, from four anchor points, then you will have a reproducible means of showing strike force. The four-point anchors cause the pendulum to move back in a more or less linear fashion. If you film how far the pendulum moves you have a metric for force. Since my wife would kill me if I drilled lots of holes in my roof, I have created an easy type of pendulum that does not require gravity to push against. 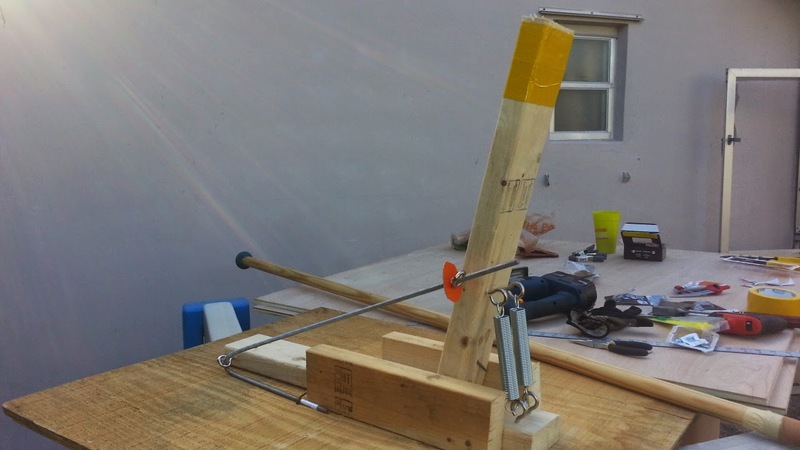 It costs about $20 and takes a half hour to build with simple tools. 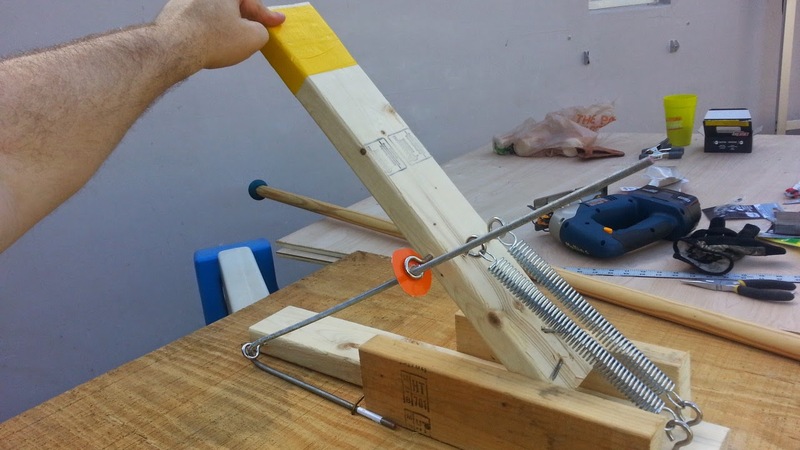 This pendulum makes use of springs to provide resistance to a 2x4 on a hinge. Note the rod on the side that goes through an eye-bolt and the round disk of plastic. This will give you a relative measure of strike force. Note that in my first attempt, I put the hinge too close to the springs. Better to move it back a bit and extend the springs with cable. When your spear strike knocks it back, the disk gets pushed back and remains in place. You could simply measure the distance the disk moved and use that as a relative measure for comparison between types of strikes. If you want a more scientific measure that can be compared between different people, get a scale, like a fishing scale, and hook it at about the height where your strikes hit and pull the board back until it reaches the point where the disk is. This gives you a quantitative measure in pounds or kg for the force needed to knock the board back that far. If you can't hit a 2x4 with your dory...practice. But you could add a larger target. Come, sip the black broth and discuss Sparta. My hope is that together we can lift the "mirage" of biased history that has led to Spartans being held up as either demi-gods or demons depending on the political and social beliefs of those writing history. I will be posting my opinions on diverse topics related to Laconian history, including social institutions and warfare, and urge all to respond. All are Homoioi at the Phitidion as long as you do not prove yourself to be a drunken helot.